Some positive remarks on the U.S. economy from Fed Chair Janet Yellen helped push gold prices solidly lower Wednesday. A potential de-escalation in the Russia-Ukraine crisis also weighed on the safe-haven metal.June gold was last down $17.50 at $1,290.00 an ounce. Spot gold was last quoted down $16.70 at $1,291.75. 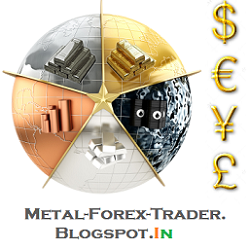 July Comex silver last traded down $0.295 at $19.355 an ounce. Gold prices were already trading moderately lower in morning dealings Wednesday and then extended losses in the wake of remarks from Yellen to the U.S. Congress. She said the U.S. economy and the economic outlook are generally on the upswing. Also negative for gold Wednesday are reported comments from Russian President Vladimir Putin that indicated he wants to de-escalate the crisis in Ukraine, including possibly pulling his troops back from the Ukrainian border. Actions speak louder than words and it’s my bias that even though Putin may have seemingly “blinked” Wednesday, this situation is not going to get significantly better any time soon. The next big economic event for the world market places comes with the European Central Bank monthly monetary policy meeting on Thursday. There is growing pressure on the ECB to implement further monetary policy stimulus measures, amid worries about price deflation in the European Union. The Euro currency is at a multi-week high against the U.S. dollar, and the strength of the common currency is also a concern to many European officials and another reason to EU interest rates. U.S. economic data released Wednesday included preliminary productivity and costs, the global services PMI, the weekly DOE liquid energy stock report, and consumer installment credit. None of the data had much of an impact on the market place. 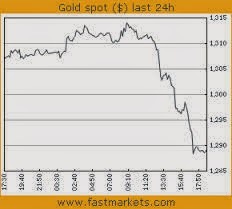 The London P.M. gold fixing today was $1,296.00 versus the previous P.M. fixing of $1,306.25. Technically, June gold futures prices closed nearer the session low and scored a bearish “outside day” down on the daily bar chart Wednesday. Bulls lost their upside near-term technical momentum. Gold bears have the overall near-term technical advantage. The gold bulls’ next upside near-term price breakout objective is to produce a close above solid technical resistance at this week’s high of $1,315.80. Bears’ next near-term downside breakout price objective is closing prices below solid technical support at the April low of $1,268.40. First resistance is seen at $1,300.00 and then at $1,310.00. First support is seen at Wednesday’s low of $1,286.60 and then at $1,280.00. July silver futures closed nearer the session low and scored a bearish “outside day” down on the daily bar chart. The bears have the solid overall near-term technical advantage. Prices are in a 2.5-month-old downtrend on the daily bar chart. Silver bulls’ next upside price breakout objective is closing prices above solid technical resistance at $20.00 an ounce. The next downside price breakout objective for the bears is closing prices below solid technical support at last week’s low of $18.685. First resistance is seen at $19.50 and then at Wednesday’s high of $19.77. Next support is seen at $19.25 and then at $19.00.